The 2013 Keble Arts Festival runs from Sunday 21st to Saturday 27th April, offering a wide variety of musical, poetic, artistic, comedic and filmic events. The festival gets underway at 8pm on Sunday 21st in Keble Bar, with live music from student soul/reggae collective Garfunkel and Camden-based indie rock band Evans the Death, whose recently released eponymous debut album has been lauded by the UK press, earning favourable comparisons to Pixies, The Smiths and My Bloody Valentine. The evening will close with a DJ set from Babylove regulars ActionStations, featuring a diverse arrangement of musical genres from dancehall and hip-hop to rock’n’roll. The launch night will also mark the unveiling and distribution of the 2013 edition of Fig. magazine, Keble’s annual anthology of undergraduate creative writing. On Monday 22nd, from 7-9.30pm in the Keble Café, there will be a poetry evening featuring slam poet Steve Larkin and comic surrealist Paul Askew. Larkin is a lecturer in performance poetry and the founder of Hammer & Tongue, with which he promotes live poetry across the UK. Askew, returning after featuring at the Keble Arts Festival in 2012, is a member of Oxford Brookes’ Poetry Centre, and curates the written content of Ferment, a writing and illustration magazine. This year’s festival includes an impressive number of film events, starting with a screening of Ken Loach’s latest documentary The Spirit of ’45 shown on Tuesday 23rd from 8-10pm in the O’Reilly Theatre. A reflection on the pivotal changes within Britain’s social and political landscape following World War II, the film has continually divided opinion. Some have criticised its unequivocal support for post-war Labour, and Loach himself has claimed that his intention is for the film ‘to make people angry’. The polemical nature of the film, especially when coupled with the recent death of Margaret Thatcher, means The Spirit of ’45 is likely to provoke heated discussion. The following evening (Wednesday 24th), from 8-9pm, the O’Reilly Theatre will host another evening of film screenings, this time showcasing short films written and directed by Oxford students. The Oxford Film Fund chose the five short films shown as winners of their biannual screenplay competition, and sponsored their production. The short films featured are: The Secret, dir. Constance Meath Baker / Roland Walters; An Evening Out, dir. Ben Cohen; Mad About You, dir. Alastair Hope-Morley; Le Marche Funebre, dir. Denis Dobrovoda; and In Vivo, dir. Tom Shennan. On Thursday 25th from 3-4pm, in the Roy Griffiths Room, ARCO, Ruskin School filmmaker Robert Rapoport will be giving a lesson in basic cinematography and lighting. Later in the evening in Keble Café, Hacked Off Films will present an immersive cinematic viewing of Darren Aronofsky’s psychological thriller Black Swan, complete with props and live acting. As with most of Aronofsky’s films, Black Swan follows an individual (here a ballerina played by Natalie Portman) pushing themselves to their mental and physical limits. 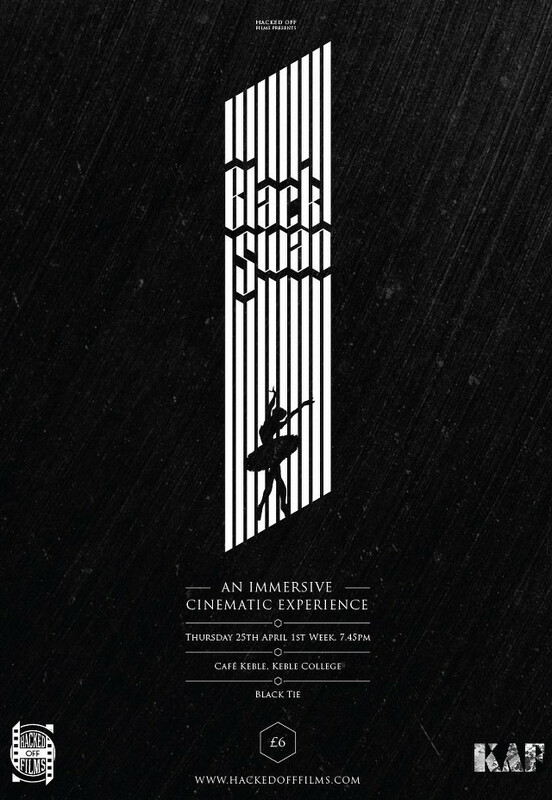 Past Hacked Off productions have emulated Hogwarts’ dining hall and the Chicago street party from Ferris Bueller’s Day Off, but Black Swan is sure to inspire a more ambitious, and likely terrifying, experience, as Hacked Off lead the audience deep into the heart of New York’s ferociously competitive ballet scene. The ‘Spring Showcase’ on Wednesday 24th, from 6-7pm in the O’Reilly Theatre, aims to demonstrate a rather less frightening side of dance, as the student-led Dream Again Dance Company perform new pieces from their repertoire, alongside informal improvisation sessions. KCMS, the Keble College Music Society, will also be presenting two events over the course of the festival. On Friday 26th from 6-6.45pm, baritone Matthew Dawson will sing Benjamin Britten‘s complete Irish folk song arrangements in the Pusey Room. This concert marks one of a series of events Keble are holding in celebration of the British composer’s centenary this year (see www.brittenatkeble.co.uk for further details). On Saturday 27th at 7.30pm David Goode, Organist at Eton College, will perform an organ recital as part of the 2012-13 Recital Series. Saturday will also see two lively events to close the week: Alice in Wonderland-themed croquet (fancy dress recommended), from 5-7pm in Liddon Quad, and the After Party Bop, from 8-12pm in Keble Bar. Other events include an introductory life drawing class (on Tuesday 23rd, from 2-4pm in the Music Room), a zumba workshop (Wednesday 24th, from 2-3pm in the Roy Griffiths Room, ARCO), a talk and workshop on art history by Wellcome Trust award-winning artist Kirsten Norrie (Friday 26th, from 2-4pm in the Keble Café), and a student comedy night (Friday 26th, from 8-10pm in the Keble Café). Throughout the week artworks by professional local artists and students Clare Bassett, Susan Moxley, Caroline Gilbert, Valerie Petts, Sara Alleyn, Flora McLachlan and Francesca Shakespeare will be exhibited in the Keble Café. The Keble Arts Festival runs from Sunday 21st to Saturday 27th April. All events are free, other than Hacked Off Films Presents Black Swan, tickets for which are £6 and can be purchased from www.hackedofffilms.com. There are only ten places available for the life drawing class, and those wishing to attend must book a place by e-mailing rebecca.luffman@keble.ox.ac.uk. Those wishing to attend the art history talk and workshop are also recommended to book in advance, by e-mailing maeve.sinnott@keble.ox.ac.uk. Those wishing to participate in the cinematography and lighting class are encouraged to bring their own camera. For more information about any of the events please visit www.kebleartsfestival.com or contact Miguel Angel Rodriguez-Correa Henderson by e-mailing miguel.rodriguez-correa@keble.ox.ac.uk.